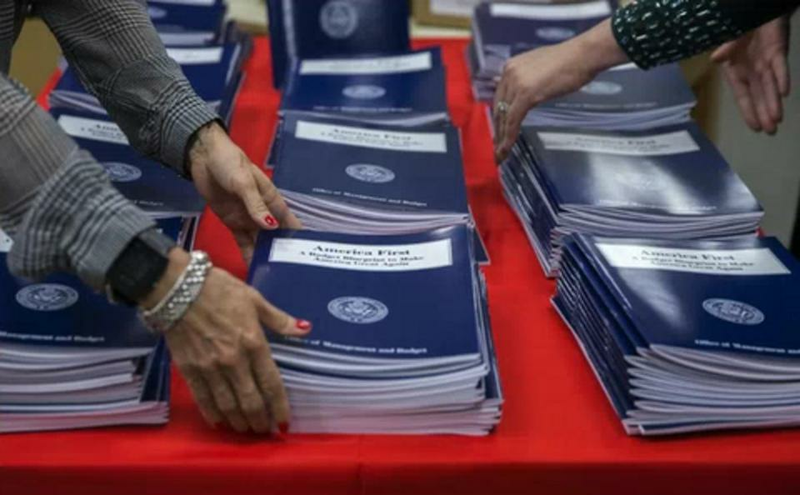 Copies of President Trump’s America First budget at the GPO bookstore in Washington, D.C.
What follows is a list of everything that President Trump’s budget proposal calls for eliminating funding for entirely and how much those cuts are estimated to save. • Water and Wastewater loan and grant program, $498 million. • Discretionary activities of the Rural Business and Cooperative Service, $95 million. • McGovern-Dole International Food for Education program, which aims to reduce food insecurity. Savings estimate not listed. • Economic Development Administration, which provides small grants, $221 million. • Minority Business Development Agency, which promotes minority business entrepreneurship. Savings estimate not listed. • Federal funding for Manufacturing Extension Partnership program, which subsidizes state centers that provide consulting services to small- and medium-size manufacturers, $124 million. • Supporting Effective Instruction State Grants program, $2.4 billion. • 21st Century Community Learning Centers program, which supports before- and after-school programs as well as summer programs, $1.2 billion. • Federal Supplemental Educational Opportunity Grant program, which delivers need-based student financial aid, $732 million. • Eliminates or reduces 20 categorical programs, including Striving Readers, Teacher Quality Partnership, Impact Aid Support Payments for Federal Property, and International Education programs (additional programs, and which will be eliminated versus reduced, not listed in budget). Savings estimate not listed. • Advanced Research Projects Agency-Energy, Title 17 Innovative Technology Loan Guarantee Program, and Advanced Technology Vehicle Manufacturing Program, which are involved in disruptive energy research and development and innovative technologies. Savings estimate not listed. • Weatherization Assistance Program and the State Energy Program, which when grouped with several other reductions in the Energy Department, result in a total cut of $2 billion. • Funding for specific regional efforts, such as the Great Lakes Restoration Initiative, the Chesapeake Bay, and other geographic programs (additional programs affected were not named in budget), $427 million. • More than 50 EPA programs, including Energy Star, Targeted Airshed Grants, the Endocrine Disruptor Screening Program, and infrastructure assistance to Alaska Native Villages and the Mexico Border (additional programs affected were not named in budget), $347 million. • Fogarty International Center. Savings estimate not listed. • Health professions and nursing training programs (budget did not list which programs or how many affected), $403 million. • Discretionary programs within the Office of Community Services, including the Low Income Home Energy Assistance Program and the Community Services Block Grant, $4.2 billion. • Discretionary appropriation for the NFIP’s Flood Hazard Mapping Program, $190 million. • Eliminates or reduces state and local grant funding for programs administered by the Federal Emergency Management Agency, such as FEMA’s Pre-Disaster Mitigation Grant Program and the Homeland Security Grant Program, $667 million. • Community Development Block Grant program, $3 billion. • HOME Investment Partnerships Program, Choice Neighborhoods, and the Self-help Homeownership Opportunity Program, $1.1 billion. • Section 4 Capacity Building for Community Development and Affordable Housing, $35 million. • Various programs, including discretionary Abandoned Mine Land grants, National Heritage Areas, and National Wildlife Refuge. Savings estimate not listed. • State Criminal Alien Assistance Program, which reimburses states for costs of incarcerating certain criminal undocumented immigrants, $210 million. • Other programs (budget does not name any), $500 million. • Job training grants, including the Senior Community Service Employment Program, which aims to transition low-income, unemployed seniors to unsubsidized jobs, $434 million. • Bureau of International Labor Affairs’s grant funding, $60 million. • Office of Disability Employment Policy technical assistance grants. Savings estimate not listed. • Occupational Safety and Health Administration’s training grants, $11 million. • Office of Education, $115 million. • Grant programs, including PRIME technical assistance grants, Regional Innovation Clusters and Growth Accelerators, $12 million. • Global Climate Change Initiative and Green Climate Fund and its two precursor Climate Investment Funds. Savings estimate not listed. • Emergency Refugee and Migration Assistance account. Savings estimate not listed. • Peacekeeping and security capacity building efforts and contingency programs, such as the Complex Crises Fund. Also eliminates direct appropriations to small organizations, such as the East-West Center. (Further examples not listed in budget.) Savings estimate not listed. • Essential Air Service program, which provides subsidized commercial air service to rural airports, $175 million. • TIGER discretionary grant program, which awards funding for projects, $499 million. • Community Development Financial Institutions Fund grants, $210 million.